When I was teaching third grade, I noticed children missing a word problem because they couldn’t remember if the word “sum” was an adding word or subtracting word. I could tell them a million times but nothing helped until I made up this little rhyme, they could easily remember! When you add in your head! After learning the rhyme I told them the word spelled “sum” in the rhyme was incorrect. It should have been “some”. The kids loved writing sentences using both “some” and “sum”. Some add to get the sum! Word problems have a lot of confusing words, like sum, difference, altogether, total, in all, less than, etc. I remember being asked, “Mrs. Yates, is “difference” an adding word or subtracting word?” Again a short little rhyme to the rescue. It’s hard for kids to remember a lot of the math words. 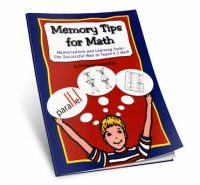 We need to give them memory tips to help them remember. Just turn on the creative juices and come up with your own little pictures and rhymes to help your kids remember.